Ease into relaxation with this power glider recliner that features plush arms and a full chaise cushion. Window pane tailoring in the seat back offers a unique, yet casual design to the piece. Easily find the perfect position with the power reclining feature of this recliner. The Jemma Casual Power Glider Recliner with Full Chaise Cushion by New Classic at Carolina Direct in the Greenville, Spartanburg, Anderson, Upstate, Simpsonville, Clemson, SC area. Product availability may vary. Contact us for the most current availability on this product. Soft fabric and plenty of support from the cushions in the Jemma collection will make evenings at home casual and comfortable. 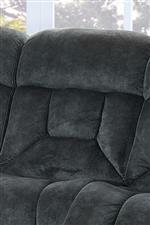 Reclining loveseats and sofas, as well as gliding rocker recliners promote relaxation. Tailoring in the seat back creates a unique look and full chaise cushions throughout offer total support for your body. Hardwood frames ensure durability. Available in manual and power reclining options. The Jemma collection is a great option if you are looking for Casual furniture in the Greenville, Spartanburg, Anderson, Upstate, Simpsonville, Clemson, SC area. Browse other items in the Jemma collection from Carolina Direct in the Greenville, Spartanburg, Anderson, Upstate, Simpsonville, Clemson, SC area.